These Easy Spinach Balls are a perfect party appetizer. Prep the recipe ahead of time for easy entertaining or serve them as a kid-friendly vegetable option at dinner! As I’m sure all you football fans out there know, The Super Bowl is coming up in a couple weeks! And that means one thing – party time! And the best part about parties is food! Specifically, finger food! 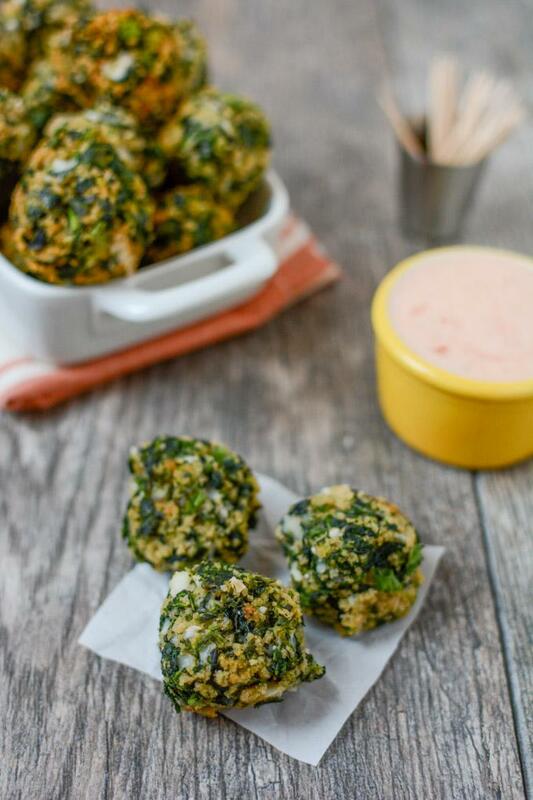 Enter these Easy Spinach Balls. These are one of my dad’s all-time favorite foods. My mom has been making these for years but my dad always complains that she doesn’t make them often enough. While we were visiting them for Christmas, she made some and would you believe that Squish literally gobbled them up? He thought they were the greatest!! So, these could alternately be titled- how to get your one-year-old to eat a green vegetable. #winning. Problem was, my mom’s recipe was slightly lacking in the nutrition department…so when we got home from our visit, I did some playing around with the recipe in my own kitchen and came up with a slightly modified version that still tastes just as good! 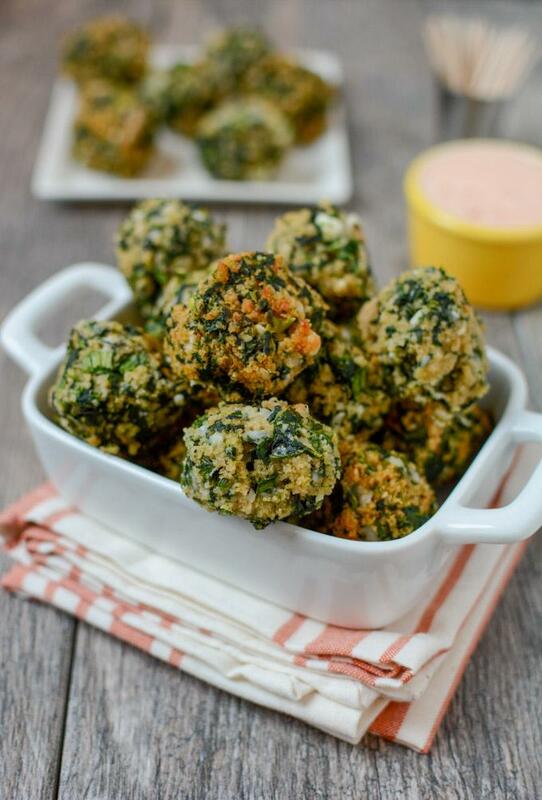 These Spinach Balls are a perfect party appetizer. Prep the recipe ahead of time for easy entertaining or serve them as a kid-friendly vegetable option at dinner! Defrost spinach and wring well in a towel to remove excess moisture. Combine all ingredients in a bowl and mix well to combine. Form into balls with your hands, squeezing tightly. Bake at 350 degrees for 13-15 minutes, turning once. You can easily eat these plain, but if you’re feeling fancy, you could whip up a quick dipping sauce to go along with them! I mixed some thai chili sauce with plain yogurt and sriracha and it was a great combo! If you are serving these at a party, you could easily prep them ahead of time and then just pop them in the oven right before party time. My next test will be to see if these freeze well. Since Squish loves them, it’d be nice to have some on hand in the freezer that I could just pop out and defrost to serve him with dinner. I’ll keep you guys posted on how that works. My parents are coming into town this week so it’ll be the perfect time to test them out. 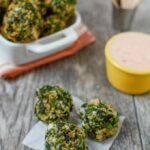 Serve these Easy Spinach Balls from @leangrnbeanblog at your next party! I make a very similar spinach “burger”. The whole family loves ’em. I never thought to make them in ball form. What a perfect appetizer! oooh i’ll have to try a burger version now! I’ve been trying to add more greens to my diet these days! It’s so hard when you look at all the food you eat and realize it’s mostly brown and yellow lol. More green is always good! Yum! Way to go for the veggie win! I feel like sometimes it can be so hard to get veggies in at super bowl/ game day parties aside from the veggie tray! yes! these are an easy way to change things up! Yum!! I love spinach and easy. Definitely plan to make these. & Go panthers! These look great! I will probably be eating a mac ‘n cheese pizza because I have a serious carb problem on the weekends. I need carbs on top of my carbs. So perfect for game day. Even the sickest of eaters will eat spinach with these! These look awesome! I’m trying to find more ways for the kiddos to eat veggies- these look perfect! Pinned 🙂 Thanks girl! These sound amazing!!! Almost like a spinach dip, in bitesize form, haha. Love this idea! Lindsay do you have to use frozen spinach? If so, if I have a surplus of fresh spinach could I just freeze that and use it? Thanks! if you’re going to use fresh i would maybe blanch it to cook it and then wring the water out. you may need to chop it up before you cook it! hmmm you could definitely try something like broccoli. i think that would work!! I was wondering how freezing and cooking these later went? Trying to find a recipe to make for my long term care centers! i remember they turned out well but can’t remember the exact time and temp. def worth trying and playing around with though!